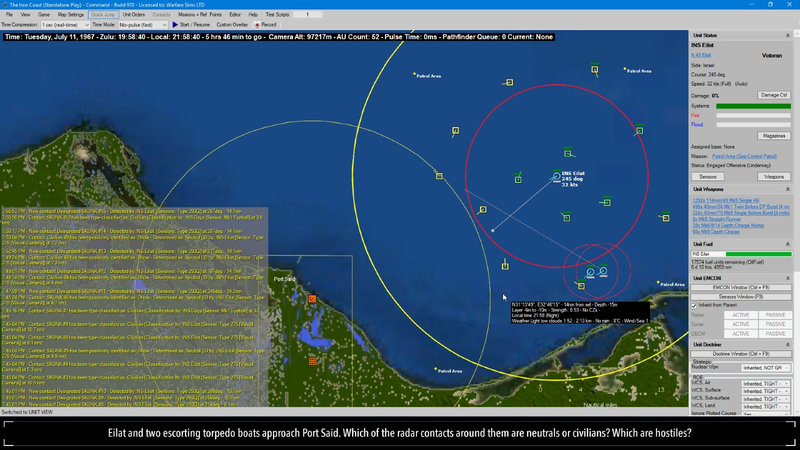 Command: Shifting Sands is the latest stand alone expansion for the massively detailed naval and combat simulator that is Command: Modern Air/Naval Combat (CMANO). 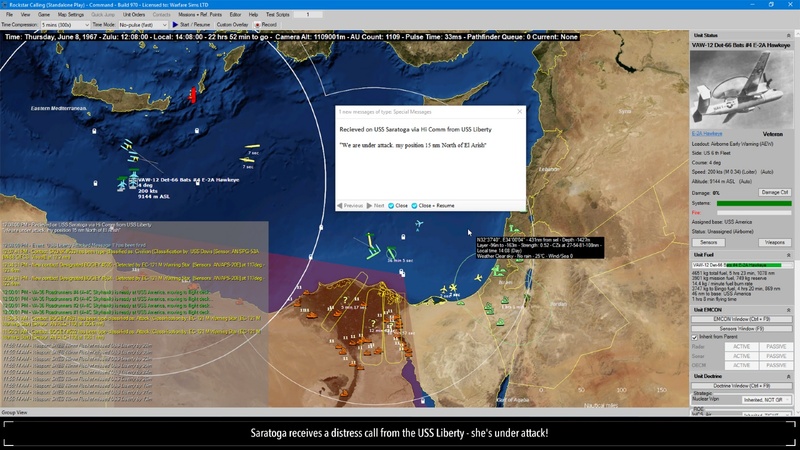 Developed by Warfare Sims and published by Matrix/Slitherine, CMANO is a powerful simulator that lets the player explore detailed scenarios depicting air and naval combat of every stripe since WW2 to the present and even a little beyond. Just about every ship, aircraft and submarine that has ever been built is in the game database. The primary drawback is that CMANO has a hefty price tag. There also isn't a demo, so to give curious players a chance to get their hands on the gameplay without too much of a hit to the wallet, the developers have put out several stand alone campaigns. The other two, Chains of War and Northern Inferno, featured hypothetical conflicts. Shifting Sands, on the other hand, features the numerous historical battles between Israel and its not so friendly neighbors over the course of several decades. While you won't have access to the full CMANO database, you do get to play with toys from a few different technological time periods. In several cases these scenarios depict the historical first use of some new weapon or tactic. As mentioned, Command is a real-time simulation of air and naval combat, calculating for just about every variable you could imagine. Real time as in the game literally ticks by one real second at a time unless you speed it up. Direct ground combat is depicted to a much lesser degree, though there is no shortage of targets on the ground and things like anti-aircraft units shooting back at you. The game sacrifices a great deal in one area to make its extremely broad scope possible, the graphics. This is a game involving a lot of map staring, as simple icons representing units move around and fire little dots at each other. What the game lacks in cinematic visuals it more than makes up for with some serious number crunching going on under the hood. This game includes more details than I could possibly discuss here, but just to name a few: terrain, weather over a ground target, the temperature of the water at various depths, airspeed and weight with regards to fuel consumption, realistic time needed to rearm and refuel aircraft, and the airspeed velocity of an unladen swallow all play a factor. Okay, maybe not that last one. The key point being that the developers have attempted to include just about every significant factor involved in the operations depicted. You very well may need to do some homework to fully understand what is happening in the game. Fortunately, Command makes it easy to at least get started. Shifting Sands comes with several training scenarios, and a newbie player will be wise to go through them all more than once while keeping the manual open in another window. This will get you familiar with the core mechanics, however it won't teach you much about how to conduct a large scale complex operation on your own. There are a few great sets of videos on YouTube which can help in that regard. This is the mark of a truly great wargame: the game gives you all the tools you need to simulate a realistic battle scenario, but requires you to actually develop and employ realistic tactics to succeed. Simply launching every aircraft you have and throwing them at the enemy won't get you very far at all. You will need to analyze the situation and deploy your units with a degree of precision if you want to make a good showing. Learning all of these tactics and stratagems is part of the experience of playing the game, and shouldn't scare anyone away. I think most people buying a game like this do want to learn about those sorts of things, and the game will reward you for it. The mechanics of the game might look overwhelming at first, but really you can get started without delving too deeply into the dozens of options and functions available. As the commander, your job isn't to micromanage every unit and weapon. The AI can do a decent enough job as long as you give it the right orders. This is done simply by choosing an area or target for a mission and then assigning units to it. There are default mission types set up for just about everything you might need, from anti-submarine warfare to air superiority ops. Within each mission, you can tweak all the finer points. Do you want aircraft to launch in flights of two or three aircraft each? Do you want your ships to investigate and potentially engage targets out side of their designated patrol zone or should they stay put? You can also set the rules of engagement and behavior for the AI at the unit and mission level, and also general orders for your entire side. These settings tell the AI how to act in various situations so that you don't have to manually intervene constantly. Once you have a grip on the basics, the game lets you go much deeper. For example, a ground strike mission can be built by the player selecting exactly which aircraft in a group will target which buildings and with what weapons down to the exact number of bombs dropped. You can also plot a course and set altitude and speed. Taking control like this will let you pull off much fancier maneuvers and likely see better success in the more complex scenarios. And Shifting Sands will give you more than a few complex scenarios to deal with. The campaign starts off with a little taste of naval action during the Suez Canal Crisis and then a solid air combat scenario that requires you to perform recon, attack, defense, and air superiority missions all at once but is still manageable. After that, it's off to the races with scenarios such as Operation Focus, the opening move of the Six Day War in which the Israelis historically destroyed almost the entire Egyptian air force. The naval scenarios tend to be much less complex, due to the smaller numbers of units involved, but are still made interesting because one major error could cost you the win. This is also an area of the world that has a ton of civilian shipping, making it tricky to pick out foes until they are either dangerously close or already firing at you. That said, the aircraft focused missions are the star of the show here. While you can play through the campaign in chronological order, you can also just pick out the scenarios you are most interested in from the list. The only difference when playing the campaign is that you must reach a certain score threshold to unlock the next mission. This should serve as a good challenge for even experienced players, since simply coming out ahead in a scenario is not enough to hit that score. You will need to accomplish all or most of your objectives while avoiding taking too many casualties. There are also a few interesting "what-if" scenarios that round out this pack. One gives you a chance, as the Israelis, to use nuclear weapons in a last ditch effort to hold the line. Another puts you in command of the US 6th Fleet on the day the USS Liberty was attacked by the Israeli military, and in this scenario the United States responds very harshly. These are great examples of what can be done with Command system. not only can it simulate events that did happen historically, it can be used explore all sorts of hypothetical scenarios that might have played out. Of course, to access the hundreds of community scenarios that have been made over the past few years, you'll need to buy the full version CMANO. I think Shifting Sands serves as a great entry point for those curious. It's also a decent buy for veteran commanders. They get 17 well made scenarios to add to their collection, and can continue to support the develop of the system overall. So, if you are looking for a detailed air and naval combat simulator, and don't mind the minimal graphics and sound, you really can't do better than Command. The game has been continuously updated since its release about three years ago, and Shifting Sands benefits from all of those updates. This is a great way to try out the system and see if it's for you, without plonking down $80 or waiting for a big sale. 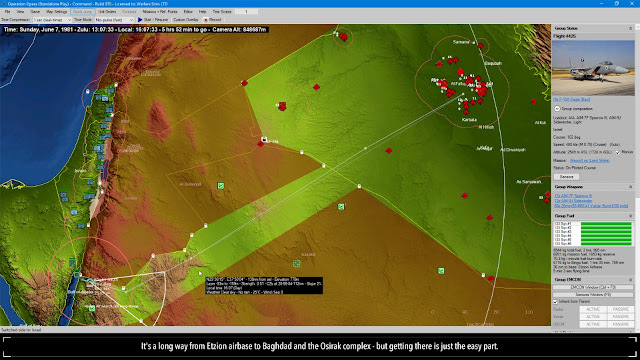 Though if you like Shifting Sands, I highly recommend getting CMANO, it's a game that you could spend years tinkering with and learning new things from. There are so many community scenarios available that the average gamer would take a lifetime to play them all. Definitely some serious bang for your buck. Command: Shifting Sands is also available on Steam. P.S. I had to borrow my screenshots for this review from the official page, since my normal means of capturing them didn't seem to agree with Command and came out rather useless. I had some really good ones too!